Another part of our cookie party the other night was to collect donations from our friends and family to take to our Christmas Party under the Broadway Bridge here in Little Rock. What is the Broadway Bridge you might ask? Oh it's a bridge. On a street (Broadway). It's also where much of the Little Rock homeless community gathers. Our church group decided that we would distribute food once a month from a certain parking lot under the bridge. Christmas Eve is one of our nights. We are hosting a Mexican fiesta and attempting to provide some additional holiday cheer (we have a tree and are wrapping up gifts like coats, blankets, scarves, socks and more). 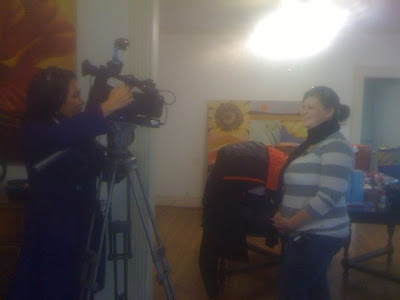 Today my lovely friend Christen and I were packing up bags and wrapping up food and scarves when we heard a local news station (Thanks Channel 11!) was headed our way. We both had a momentary FREAK OUT about our unshowered, ponytailed appearances and then they were there and done with a quickness! There was a brief interview and then some shots of Christen and me packing bags up and laughing. Here's a frame of me agreeing with her about how AMAZING our event is going to be. And, most importantly, here are some of the items we collected. We decided to do this, um, not many weeks ago (and our church is teensy; like 30 people) and we have enough for 50 to receive gloves, hats, hand warmers, scarves, socks and packets of hot chocolate and non-perishable foods. We have some sleeping bags and blankets but can always use more. (And we are on the look out for ponchos as it is supposed to be rainy/sleety tomorrow). Here is more information. If you can help, let me know. If it's too short of notice, we will be doing this once a month and are saving whatever coats and hats and other warm bits that don't get distributed for next month (if we don't find folks to give them to sooner). YOU TOTALLY WIN AT CHRISTMAS! You also win at looking pretty on the teevee whilst rocking a ponytail. Merry Christmas, sweet sweet friend. you're so rad. you make me want to be better. :) merry christmas, dear. i miss you tremendously! Ohmygosh this is so sweet. I've been overemotional lately (sorry in advance) so I got all choked up at this... You=good people, Kat. You definitely win at Christmas this year. Definitely. A so-called visit here is contained in the purchase price, but the offering is actually a glorified on-demand content library.